It's no secret that since I left the sweltering days and long, late nights of Miami behind, I've packed on the pounds - amassing an extra 40 at my peak of excess fattiness! Before we hit the ground on this new adventure, I swore I would not continue the upward climb, but would work out ways to trim my tail on the road, trudging forward with the little bit of weight loss I started enjoying this summer. The hardest part of any weightloss journey is, for me, depriving myself of rich, delicous goodies I might never have the chance to taste again - I'm a live in the moment kind of gal, you know? Trying this while traveling is not just a challenge to my willpower, but to how much Billy is willing to subject himself to, AND we really may not revisit some of these places again, so it's only fair and just for us to try absolutely everything in our path. So, I get I'm not going to drastically reduce my caloric intake (honestly, I have a jar of nutella in my bag right now). Besides, we're out here to work on our future, and food and beverage research is key. The alternative is to increase my caloric expenditure, find ways to sweat it out, and dedicate myself to working hard to be fit on the road. Our first stop is Amsterdam, and I'm excited to dive into my fitness goals. 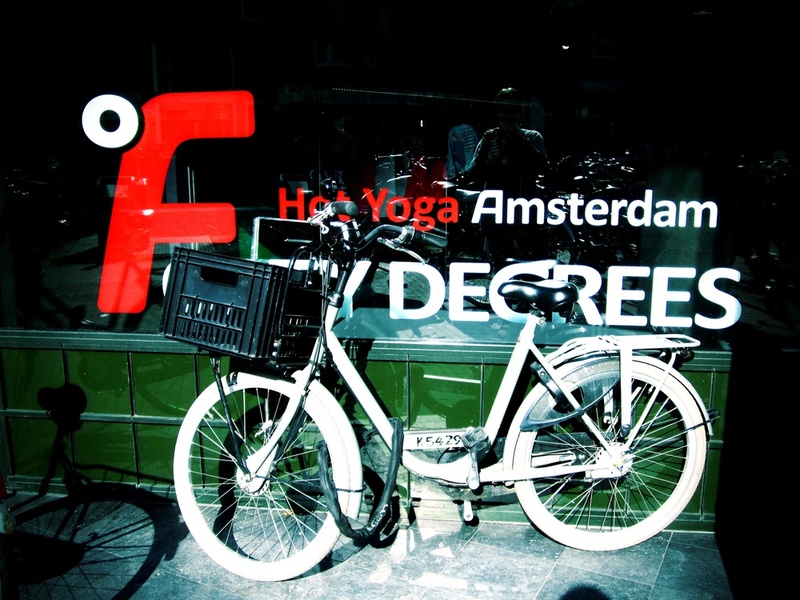 Of course, we're wanton to wander the streets, sip on beer and indulge fatty fries with mayonaisse for dipping, but first we have an appointment on Overtoom with Huub Verheij, owner of 40 Degrees Yoga Amsterdam. He's agreed to extend a complimentary class to us for the basis of this post. Huub greets us with a giant smile from behind the front desk. His studio feels both minimalist and welcoming - stark white, light wood and accents of emerald green, a smattering of interesting plants and a collection of black and white yoga photos are the only decor. Just before the entrance to the classroom is a magnificent skylight, streaming rays of bright sun down into the studio - the effect is really grounding, connecting you to the sky just before you walk inside to your practice. The class is a 90 minute Bikram style, heated to 40 degrees Celsius - 104 degrees Fahrenheit. The room is full - a great mix of age, ability and gender. Huub leads the class through two sets of each pose, once in English and once in Dutch - a great bonus for someone learning and practicing a language. His style is quick, almost staccato, dotted with encouragement and adjustments addressed to students by name, including the two of us. For me, this is wildly memorable as I've spent months in a studio where no teacher bothered to learn my name or correct my postures. We sweat through the hour and a half, pausing only for quick sips of water - Huub is the kind of teacher you want to work for, these small breaks seem like cheating under his watchful eye. At the end of the session, we both hang in savasana for a little extra time. When we finally peel ourselves from the ground, we're both soaked and move to the lobby to soak in some sunlight before the walk home. Huub checks in, happy we enjoyed the class. As if we didn't already feel welcomed, he slides a basket of complimentary oranges in our direction - that little something extra we look for in the places we love - and says goodbye. Next time we're in town, we'll most definitely be back. Huub has set the tone for my dreams of returning home fitter than I left. We love the cultural immersion he offered us, and he's helped shape our ideal studio concept, in case that becomes a possibility in our future.